Last season Bayern Munich broke almost every record imaginable under Jupp Heynckes as they steamrollered their way to the treble. At the parallel point of this campaign under Pep Guardiola they have more wins, more goals and more points in the Bundesliga than last term. With Bayern an industry best 13/5 to retain their Champions League title this season and 3/4 to beat Arsenal in the first leg of the last-16 clash, exactly how has the Spaniard achieved the seemingly impossible in improving the Bavarians? For all their sparkle with the ball, Guardiola’s Barcelona were renowned haranguers off it, pressing the opposition high up the pitch to win the ball back and launch a devastating assault on goal. That strategy has led to more Bayern goals and more clean sheets than at this stage of last season under Heynckes. In prising Mario Gotze away from Dortmund for a cool £30m, Guardiola nabbed the man who could fulfil his beloved false nine role. However, unlike at the Catalan club, the shiny-headed boss hasn’t been as blindly faithful to that mode of play at Bayern. Mario Mandzukic operates as a conventional striker, while Thomas Muller is somewhere in between the two. 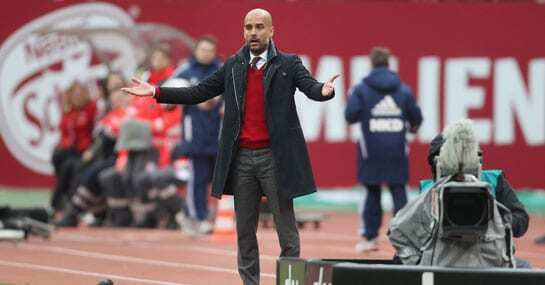 The three options allow Guardiola to switch styles depending on the opposition’s set up and makes Bayern far more fluid than Heynckes’ version. Philipp Lahm’s transformation from world-leading full-back into holding midfielder extraordinaire is a notable feather in Guardiola’s cap. But playing the German skipper in midfield makes the right-back position, occupied by Brazilian Rafinha, a weak point of the team. To counter it, the Spaniard simply ordered Rafinha to position himself nearer the centre-circle when Bayern have the ball, giving the side more options to retain their much loved central possession and limiting one-on-one exposure to the Brazilian should they lose the ball.